My first submission in the MT community, let's hope this goes well. I have already mentioned it to someone but I will repeat it again. Why do I always get to make things like that when I am not serious at all? the moment I saw it,all kinds of ideas came through my mind ( when most of it was full of DADADADADA CIRCUS DADADADADADADA AFRO CIRCUS AFRO CIRCUS AFR- *smacks self* ) so without knowing, I was messing up with it in Photoshop. That brought back some really old memories. The same process was used in my very very first wallpaper a couple of years ago. it's mostly a lot of copies of the original image placed in and blended in order to fill the empty spots. The only difference is that I also redrew parts,yes I ACTUALLY USED MY TABLET FOR ONCE and messed a lot with filters and image quality improvement. Mostly worked with contrast and lightning to make Bazette stand out in the picture and add some depth to it. The text is kinda outdated, I know. My plans were to call it Anagenesis which is the greek translation of the word ''Rebirth' and follows the events of Hollow Ataraxia but it just couldn't fit in so I got back to the basics. Even the signature itself was not made in a serious way. I simply placed it in the bottom, like I always do but then it moved by accident due to selecting a wrong layer and it ended up there. Felt okay so it got stuck in place...in other words,derp. Well,maybe it could have been executed better. Can't say that my screen is the best so I am uncertain about the overall quality . I do hope, all F/SN fans out there will enjoy this attempt of mine. Nah,in all honesty, I must thank @tsunoh and his amazing drawings. Just looking at his most recent wallpaper inspired me in a million ways. Keep up the amazing work! 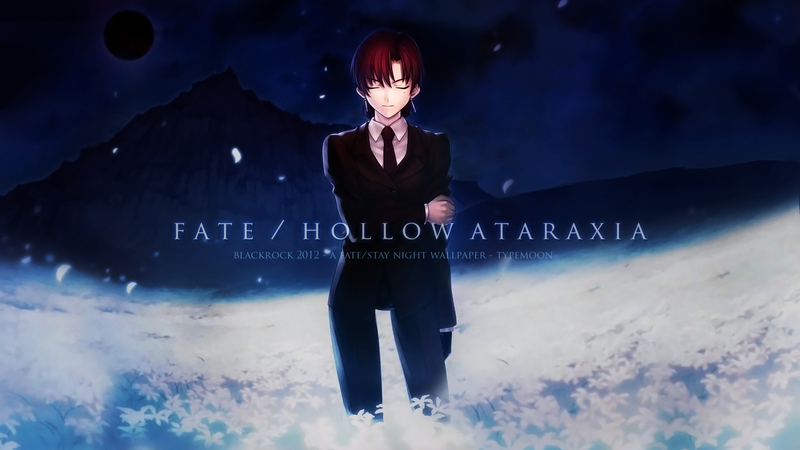 Finally someone made high quality wallpaper from Ataraxia. Thanks! I'd love to see more glow from the fields, it would add a lot to the atmosphere. Still, this is amazing, the text fits so well and I love the wide perspective. Edit: Nevermind, this looks great as is!